Home » Blog » Cycling Center Celebrates 15 years of Carl Wilson! Cycling Center Celebrates 15 years of Carl Wilson! There has been a lot of change at the Cycling Center in the past 15 years. The one constant? Long-time mechanic Carl Wilson. 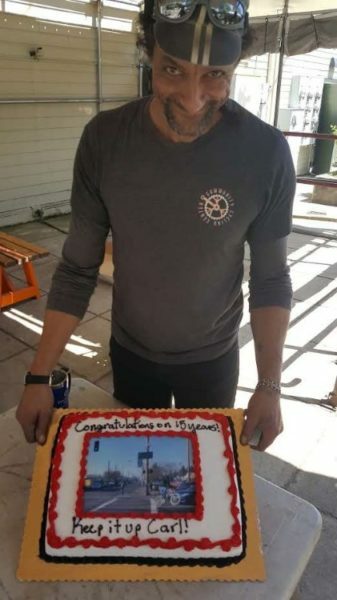 On Sunday, May 27, Carl — who started at the Cycling Center on that date in 2003 — was surprised by a host of current and former CCC employees (who were all dressed in Carl’s signature look of a cycling cap and cut-off jeans) to celebrate his 15 years at the shop. The party happened during the weekly salvage sale that Carl coordinates in back. Carl grew up in the Montavilla section of Portland where he rode his ‘Pea Picker’ Schwinn Krate to get around. After high school, Carl spent his early adult years working a variety of jobs, from construction, to telemarketing, to auto-detailing, and as Carl puts it: “every other crappy job you can think of,” before responding to a fateful ad for an open position as a bike mechanic on the back page of the Willamette Week. “I came in for an interview, and they said I needed to sharpen my skills a bit before they’d hire me.” Two weeks later Carl got a call from then shop manager (and current volunteer) David Kuch informing him he got the job. If you haven’t been by lately to see Carl, the rest of the shop team, and our wonderful inventory of used (and new) parts, please come by! We just finished a “retail space remodel” and are excited to serve you!